OTT is another name for streaming video media. 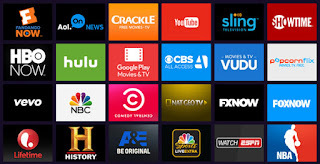 It could be a packaged deal like PlaystationVue, YouTube TV, Sling, Hulu TV, or a single network like HBO Now, Showtime Anytime, or any of the network apps from ABC, CBS, FOX, NBC, etc. This is the future of TV and the enemy of content providers like Comcast, Direct TV, Cox, etc. It's the enemy because it's how cord cutters will be able to get live TV content and primetime shows from networks without the need for a cable subscription. Some work better than others by providing more content, better DVR, better pricing, etc. and I will detail my experiences with three of them. Playstation Vue is one of the first OTT services I tried and I have to say, it's good. I personally used PSVue for over a year until I moved and didn't have local channels in my new market. Depending on your market, you'll get some local channels and a wide variety of cable channels. Hulu w/ Live TV is the next service I tried and it's great when you consider there is a back catalog of shows you can watch that have nothing to do with DVR. Hulu also has originals like Handmaid's Tale, that can't be found anywhere else. Buffered a lot on my 300Mbps network. It didn't matter what time of day, who was on the network, I had buffer problems with Hulu. $40 doesn't get you commercial free viewing. Doesn't matter if it was DVR or something from Hulu's catalog, you will have to watch commercials that you can't skip through. YouTube TV was the latest OTT service that I've tried, and I can tell you it's also very good. Local channels in the right area, unlimited DVR, available on multiple platforms, this service looks good in my limited use. In summary, of the 3 services I've tried, I would rank PSVue as #1. It provides a lot of channels, unlimited DVR, 5 streams at once which are all great features. I moved and went from 5 local channels to only one which was a bummer during football season. Losing local channels is the only drawback I can think of so if it has local channels in your area, it's the one to go with. I would rank YouTube TV #2 as the interface is clean, it's not hard to find DVR shows, and DVR is unlimited. The biggest downfalls are the lack of Discovery Channel and lack of streaming stick support. How is there no Roku app? Bringing up the rear would be Hulu TV. The interface is confusing, and it's hard to find shows you DVR'd without having to scroll through seasons of that show. For example, Law and Order: SVU has been on the air since the color TV was invented, and if I recorded a new episode, it should be easy to find that new recording. But instead I have to look in "manage DVR" to find the show among dozens of other shows (all without show names, and only episode titles) to find it. Or I can search for SVU, and get all 270 seasons of SVU and navigate to the current season, current episode. It shouldn't be this hard. Additionally, DVR space is only 50 hours which fills up quick, and Hulu doesn't offer a commercial free option with live TV. Hulu offers a commercial free option for their catalog of content, but not if you're paying $40/month for live TV. You can pay an extra $15/month to get a bigger DVR and the ability to skip commercials for DVR content, but you're still going to get ads for the back catalog. I know it's first world problems, but it's problems that shouldn't be there.